Western blot analysis of extracts from 293T cells, mock transfected (-) or transfected with a construct expressing Myc/DDK-tagged full-length human NG2/CSPG4 protein (hCSPG4-Myc/DDK; +), using NG2/CSPG4 Antibody (upper), DYKDDDDK Tag Antibody #2368 (middle), and α-Actinin (D6F6) XP® Rabbit mAb #6487 (lower). Western blot analysis of extracts from HeLa cells, either wild-type (+/+) or CSPG4 knockout (-/-), using NG2/CSPG4 Antibody (upper) and α-Actinin (D6F6) XP® Rabbit mAb #6487 (lower). 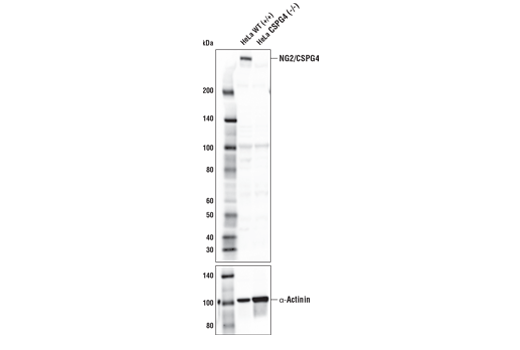 Western blot analysis of HeLa, rat brain, and mouse brain extracts using NG2/CSPG4 Antibody. 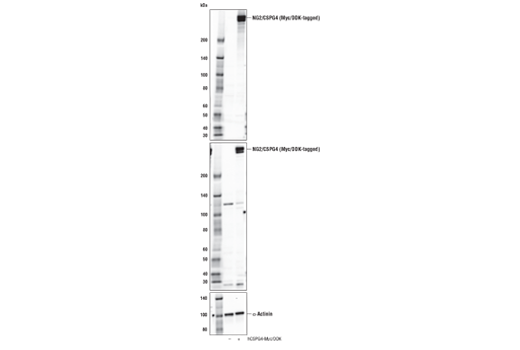 Western blot analysis of extracts from various cell lines using NG2/CSPG4 Antibody (upper) and α-Actinin (D6F6) XP® Rabbit mAb #6487 (lower). As expected, NG2/CSPG4 protein is not expressed in MCF7 cells. Immunoprecipitation of NG2/CSPG4 from HeLa cell extracts. 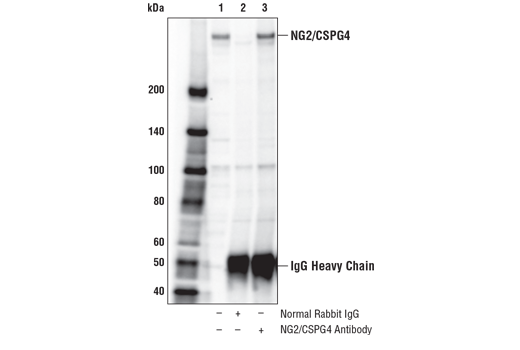 Lane 1 is 10% input, lane 2 is Normal Rabbit IgG #2729, and lane 3 is NG2/CSPG4 Antibody. 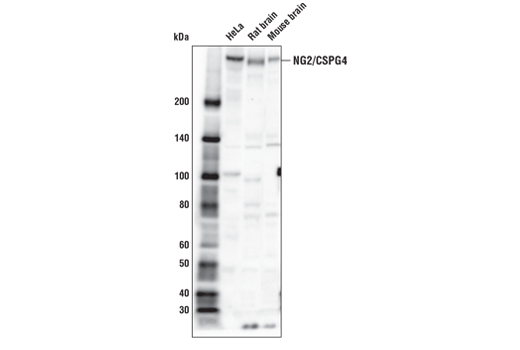 Western blot analysis was performed using NG2/CSPG4 Antibody. 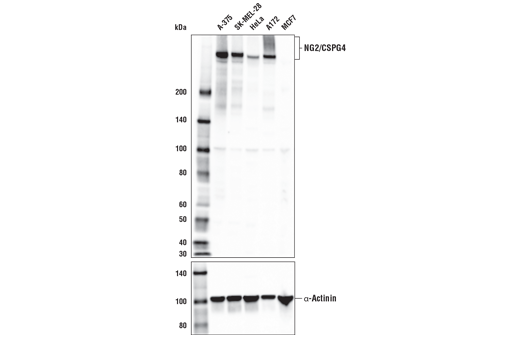 NG2/CSPG4 Antibody recognizes endogenous levels of total NG2/CSPG4 protein. Polyclonal antibodies are produced by immunizing animals with a synthetic peptide corresponding to residues surrounding Asp1410 of human NG2/CSPG4 protein. Antibodies are purified by protein A and peptide affinity chromatography. The chondroitin sulfate proteoglycan NG2 is a type I membrane protein expressed by subpopulations of glia including oligodendroglial precursor cells and a variety of tumor cells. Normal precursor cells and malignant tumor cells migrate and proliferate, but there is evidence that cells may not be able to engage in both activities at the same time. However, NG2 is involved in promoting both proliferation and motility (1). The extracellular domain of NG2 sequesters growth factors and binds to both growth factor receptors and extracellular matrix ligands such as fibronectin, collagens and laminin. The cytoplasmic domain is involved in activating Rac, Cdc42 and p130 Cas (2). PKCα phosphorylates NG2 at Thr2256, triggering the redistribution of NG2 from apical microprocesses to lamellipodia accompanied by enhanced cell motility (3). ERK phosphorylates NG2 at Thr2314, stimulating cell proliferation (4). Karram, K. et al. (2005) J Anat 207, 735-44. Eisenmann, K.M. et al. (1999) Nat Cell Biol 1, 507-13. Makagiansar, I.T. et al. (2004) J Biol Chem 279, 55262-70. Makagiansar, I.T. et al. (2007) J Cell Biol 178, 155-65.